Liked the location. Staff was very friendly. Room wasn’t very soundproof. We just ended a 3 night stay at the Rosen 7600. The rooms were clean, modern, and well maintained. We are 150% satisfied with the hotel, staff, and location. We are not satisfied however, with being asked not once - not twice - but SIX times if we were interested in the Wyndham time share. They didn’t take no for an answer. “You don’t want FREE breakfast?” “You don’t want FREE $125 cash, really?” “Come on, just talk to us. Just get familiar with our resort and our vacation ownership!” It is 2019. If I want to take a vacation, I can book it online within 15 minutes. I don’t need a time share. I don’t need to be sold on vacation ownership. And I really DONT LIKE BEING CHASED DOWN THE LOBBY! It was even worse when we were trying to book the shuttle to universal! The woman was completely talking over me, as I tried talking to the reservation coordinator. It was a terrible - sales pitchy- can’t get away soon enough - experience. Nice value for the money. Good location. Good service. This hotel may not look fancy but is REALLY nice and has all the amenities you would need for an amazing price! Hotel staff helpful in resolving reservation issue. Mattress very uncomfortable. Had bad swag/depression in middle. Air/heat unit was very noisy. Woke me up every time it came on. Che Tan who assisted me at the front desk was more than amazing. Usually check-ins are awkward and just straight to the point, but he put a smile on both my sister and my face. Will stay there again! The bathroom was infested with millipedes. I contacted the staff and they said this was normal for first level rooms next to the grass area. What's more disgusting was they explained that the millipedes crawl across the carpet in the room to the bathroom. I have video of all of them in the bathroom. The manager offered no concessions other than to switch rooms and we ended up not making our plans with friends due to all of this. I contacted Rosen via message and they said someone would get back to me in a couple of days and no word. Good location but the breakfast buffet is a little expensive. Nice place, great service but front desk staff not really enjoy working there. Very clean and comfortable. A great value. Very well located. Nice hotel, close to everything. Very nice restaurant in hotel with buffet breakfast and dinner. Bar in hotel as well. The room set up was not convenient for a comfortable stay with a King bed inside the room. As soon as I got to the hotel I checked the sheets and there was two different types of hairs in the bed. So when I called the front desk to get the sheets changed, the cleaning crew had an attitude because I made them change the sheets in front of me. I later saw in the corner there was this huge bug and the last day before checking out I had to kill two spiders. The stay was terrible, I will never stay at Rosen Inn again nor will I recommend anyone to stay here. Nice location walking distance to lots of places. Staff is super friendly. Great place for kids and dogs lots of grass area! Nice happy hour! Only bad thing is they only have full size beds. Nice pools except heater was not on so was cold. Rosen Inn International places you in Sand Lake, within a leisurely stroll of popular sights such as ICON Orlando and Ripley's Believe It or Not. This 3-star hotel has 728 rooms and welcomes guests with a restaurant, an outdoor pool, and free in-room WiFi. Enjoy a bite to eat at the hotel's restaurant, or relax with a drink at the bar/lounge. You can sip a beverage at the coffee shop/café. Start your day off with buffet breakfast, available for a fee. A flat-screen TV comes with cable channels and pay movies, and guests can stay connected with free WiFi. The bathroom offers hair dryers and free toiletries. Other standard amenities include a refrigerator, a microwave, and a coffee maker. At Rosen Inn International, guests enjoy features like an outdoor pool, a fitness center, and free WiFi in public areas. You can take advantage of free parking, along with limo/town car service. The front desk has multilingual staff on hand 24/7 to help with luggage storage, securing valuables, and tours or tickets. Other amenities at this family-friendly hotel include a business center, laundry facilities, and a banquet hall. Thank you for taking the time to leave a review. We are glad you have enjoyed your stay with us at Rosen Inn International. We appreciate your business and look forward to hosting you in Orlando again soon. Thank you for taking the time to leave a review. We are glad you have enjoyed your stay with us at Rosen Inn International. It is our pleasure to provide our guests with a clean, comfortable, and convenient place to call home when visiting the Orlando area. It is great to hear that our friendly and helpful staff could add value to your stay. Your feedback has been noted and helps us better our hotel. We appreciate your business and look forward to hosting you in Orlando again soon. Thank you so much for sharing your review. We are very sorry that your vacation and comfort was affected by the third party timeshare sales in the lobby. Their services are provided in return for discounted tickets. We fully understand that not all guests are interested and we encourage you to walk away if this option does not appeal to you. Your feedback is greatly appreciated so we continue to improve the guest experience we have to offer here at Rosen Inn International. Thank you for your review. We are glad that you enjoyed your recent experience with us at Rosen Inn International. It is great that our staff was able to assist you in resolving any issue with your reservations. We sincerely appreciate your business and hope to welcome you back soon for another memorable experience. We are so sorry to read your stay with us was anything less than satisfactory. We will be sure to share your feedback with management so they can look into replacing the mattress and making sure the AC unit is functioning properly. We appreciate your feedback and hope to have you with us again. Thank you for your kind review. We are glad that you enjoyed your overall experience with us at Rosen Inn International. You comments about the mattresses have been noted and will assist us as we continue to improve our amenities and services that we offer all guests. We appreciate your business and hope to welcome you back to Orlando soon. Fountain View Cafe - Restaurant serving breakfast and dinner. 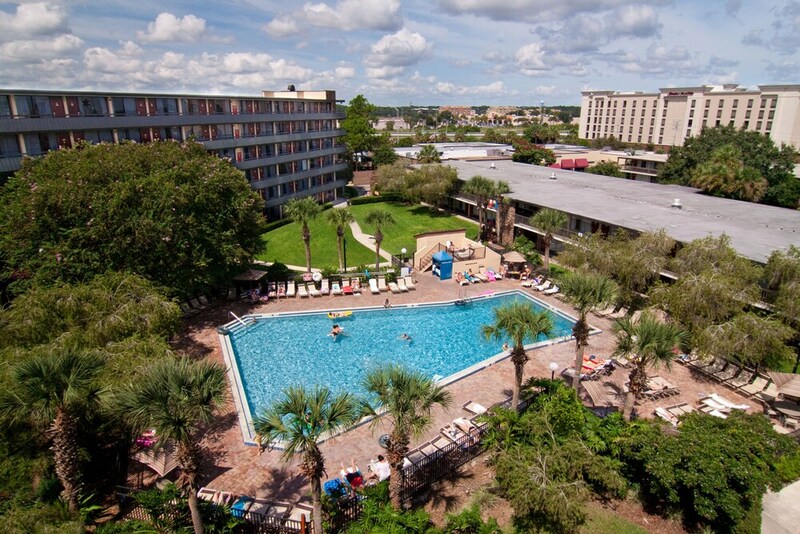 Recreation features at Rosen Inn International include an outdoor pool and a fitness center.